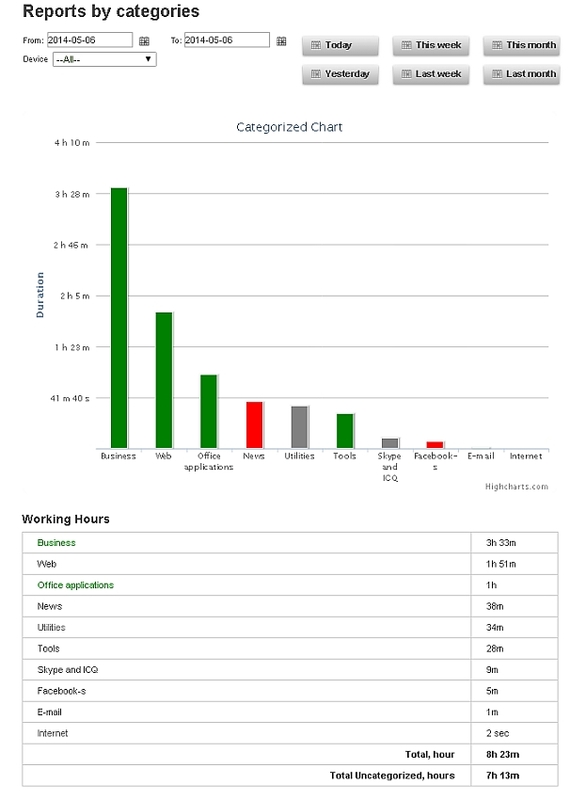 Reports by categories provide you with a graph showing the categories of applications used and sites visited. This graph allows you to quickly determine what kind of tasks an individual employee or the entire department are occupied with most. You can assign sites or programs to categories yourself. Under the graph you’ll find the total amount of time spent working in each category. For each program and website you can assign it to a Category, such as Business, News, Games, etc. Categories can be assigned to productivity values, and so StaffCounter can calculate how productively your staff have been working. “Total Uncategorized, hours” shows how much time has been spent in programs and websites that have not been assigned to a category.